Back in lesson 3, we saw that different assets can perform differently at different times. But what are these assets? And why should they go their own way? An asset is something you can own, buy, and sell. It’s the opposite of a liability. A house that you own is an asset. Your mortgage is a liability. One man’s asset can be another man’s liability. Your mortgage is a valuable asset for your bank. You’re contractually obliged to pay it back, plus interest. 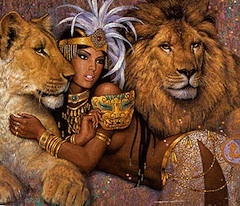 Just as the natural world is divided into broad classes like mammals, fish, and fungi – and mammals then divided into cats, monkeys, and many more – the world of assets divides into big groups, with subdivisions. In investing, these big groups are called asset classes. Economic conditions – Inflation, interest rates, and economic growth affect different asset classes differently, and at different times. Emotion – Investors (asset buyers) are by turns fearful and greedy. Let’s consider a fictitious company: Brixton Unlimited Nappy Services (Stock market symbol: BUNS). BUNS was founded in 2000 to sell nappies to mums across London. To raise the money to get started, BUNS floated on the stock market by issuing 100,000 shares at £10 each, raising £1,000,000. These shares can now be freely traded between investors, so the price changes. Each share is a part ownership in BUNS, entitling the owners to a certain share of the company’s fortunes. Note that only the initially floatation actually invested money into the company. If you buy ten shares in BUNS from me, a fellow private investor, then no money goes back to BUNS. It’s similar to if you buy a 1930s semi-detached house or a Van Goch painting – no money goes back to the builder or to the artist from these second hand purchases. Only shares issued directly by the company brings money back to its own coffers. After a while BUNS wants to expand. It could issue more shares to do so – raising more money by dividing itself up to increase the shares in issue to say 200,000 – but that would dilute existing shareholders and reduce the price of existing shares. Many BUNS directors are also BUNS shareholders, and they don’t like the sound of that! Instead it issues 100,000 bonds at £1 each. These bonds promise to pay the owner 10% interest every year for 10 years, at which time they will be redeemed by the company (cancelled) and anyone owning the bonds will get £1 back. The bond issue raises £100,000. The company spends £60,000 of it on a new nappy shop in Chiswick – an investment in commercial property. It keeps the other £40,000 as cash in the bank for future investment. The annual interest due to the bondholders is paid from the company’s earnings. After a while, managers get fed up with the price of their nappies going up due to rising raw material costs. They spend £30,000 to buy a special kind of share – an ETF – which tracks commodities like cotton. They hope that if cotton prices go up, reducing profits, it will be partly offset by the ETF price rising, too. Business goes well, and soon BUNS is making millions. It can easily pay the interest on its bonds and also pay shareholders an increasing dividend. Eventually success goes to the directors’ heads, and they decide they deserve to work in classier surroundings. They’re also a bit bored of the boring nappy business. They buy several trendy paintings by the graffiti artist Banksy for the office. They tell shareholders that the paintings are an investment in alternative assets! 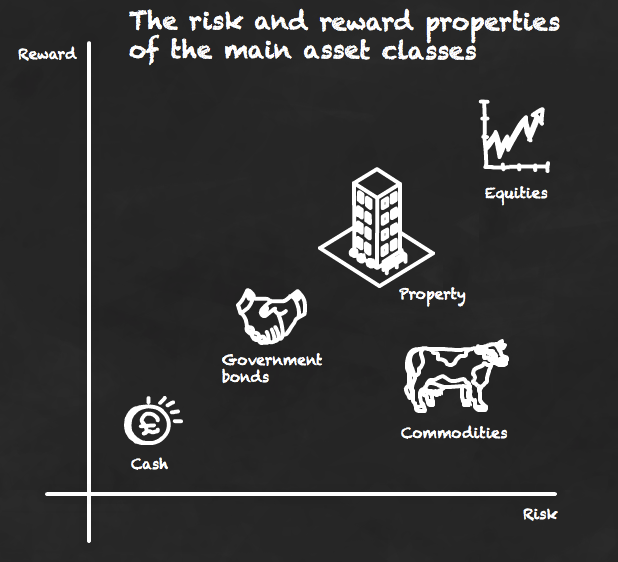 Different asset classes have different risk versus reward traits. We’ve already seen, for example, how cash is the safest asset class. The riskiest mainstream asset class is shares, but the rewards can be higher, too. As we saw in lesson three, however, a lot depends on when you buy your assets. Asset classes or sub-classes can become overvalued as a whole – think Spanish property in 2008 or Dotcom shares in 1999 – as well as undervalued. Risk and potential reward rises towards the top right of the graph. Note the difference between an asset class, and an asset within that class. Tesco and Barclays shares are both assets from within the same asset class. Cash you keep in a Barclays bank account is from an entirely different asset class. Many new investors think they are well-diversified because they have a portfolio of 20 different companies. But all those holdings are in the same class: Shares! Vertical diversification – Splits money between several different asset classes. Horizontal diversification – Hold different assets within an asset class. To achieve a well-diversified portfolio, an investor first splits her money between different asset classes, and then further spreads it around by buying different assets with each sub-division. For example, allocating 20% of your money to equities gives you exposure to the asset class of shares1. If you put that 20% into a UK index-tracking fund, it is then further spread across the many companies that make up the index. Choose a global tracker fund and it’s spread even more widely. Vertical diversification helps protect you from stuff like a stock market crash or a property slump – or from missing gains because all your money is in cash. Horizontal diversification protects you from more local troubles, such as a company making a loss or a bond defaulting on the income it owes you. Money is like muck. No good unless spread. By muck he means animal manure. Great if spread about to fertilize future crops. A potentially stinking liability if left in a pile in one corner! 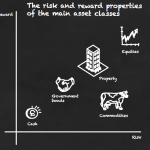 There are only six main asset classes that you really need to know about. Cash, Shares, Bonds, Property, Commodities, Alternative Assets. Within each asset class are many different specific assets. Good diversification is spread between asset classes, as well as assets. This is one of an occasional series on investing for beginners. You can subscribe to get our articles emailed to you and you’ll never miss a lesson! Why not tell a friend to help them get started? Since you are handing out a free education, I’ll give you a free teaching tip. Never use the same number for two different items in an illustration. Thus “The bond issue raises £100,000. The company spends £60,000 of it on a new nappy shop in Chiswick – an investment in commercial property. It keeps the other £40,000 as cash in the bank for future investment …. They use the £40,000 to buy a special kind of share …” See: there is now no chance of the novice confusing one £50k with the other £50k, because instead we have a £60k and a £40k. Remember the whole point of being a novice is that you are struggling to understand new stuff: the teacher should supply silent help. Keep up the good work; it’s much appreciated. Only commenting to clarify, keep up the good work! Is it worth pointing out for beginners that the term equity can be used for things other than shares? Thus if one owns a house with a mortgage on it the value of the house minus the value of the outstanding mortgage is considered to be the equity that one has in the house. Hence if you take out a large mortgage on a house and the value of the property falls below that of the mortgage one is said to be in negative equity. @dearieme — Point taken, I’ve changed the numbers above to follow your advice. Cheers! That said, I do see what you’re saying. I think of silos, too. I think the terms come from “verticals” in other areas of business, so if (say) Virgin decides to get into the smartphone business, that would be a new “vertical” whereas if it added helicopter flights to its Virgin Atlantic Airlines (assuming it still owns them – I forget!) then that’s diversification within its “air transport” vertical. @Ignorant — Yes, I suppose that could be a confusing word for newcomers. Very hard to know where to draw the line with these things — it’s just one post, but any point in it could be expanded to several chapters of a book. I’ll leave your comment in for anyone confused however. A most excellent piece of work! All things being equal (since this is a siml,e teaching model), the newly issued shares will be sold at the market price of the existing shares, and those proceeds will accrue to the company. Therefore, the assets of the company increase by as much as the value of the extra shares issued (asset class: cash). The price of the existing shares doesn’t fall at all — there is no dilution of value whatsoever. There is an apparent dilution of control, because each old shareholding now has half as many rights as before, thanks to the new shares, but the size of the company being controlled has doubled. Issuing new shares for cash at market value is neutral for existing shareholders. @Jonathan — Yes, perhaps better I took that approach for simplicity, although nearly always a share price will fall in response to a cash raise beyond the theoretical equilibrium in my experience, at least for a time. It looks like Property is a bit of a halfway house between Bonds and Equities. Great article. This is exactly what Tim Berners-Lee must have must have hoped for. If they were alive the creators of TV would look on in horror at the use of the medium they created. Thankfully the internet has stepped in to get knowledge to the people. Well done and I look forward to more advanced posts! I like very much this educational “beginner’s” posts. I never get tired of reading the same simple fundamentals explained 40 times in 40 different ways. And for all the complexity of finance, to have a clear grasp of the most important basic ideas is what really matters at the end of the day. Thank you for a very interesting article on assets. How would you classify a future entitlement to a final salary pension in terms of an asset class? I am due to retire in just over 7 years on a pension of 50% of final salary and a lump sum of 3 x annual pension. In today’s money that will be a pension of around £27,000 and a lump sum of £81,000. I have just started a passive index investing approach to supplement my pension. I have only one fund which is a HSBC World index Fund. My thinking is that the final salary pension resembles a fixed income asset and dwarfs the £10000 I have invested in the above ETF. Would you agree that however I allocate my savings there is no need for further fixed income? I appreciate that you are not a financial advisor but on the general question of how to classify a future pension entitlement I would be interested in opinions. As a passive reader, I would like to say thanks for keeping at it. It’s the best investment blog I read and I invariably learn something new each week thanks to you and your well-chosen links. You have saved me from many expensive mistakes and helped me refrain from unnecessary activity. So, sorry about lack of feedback and thanks again.